where and are distinct positive odd integers and and are distinct positive even integers. How many elements are contained in the set ? Suppose we know , but we do not assume the second statement. 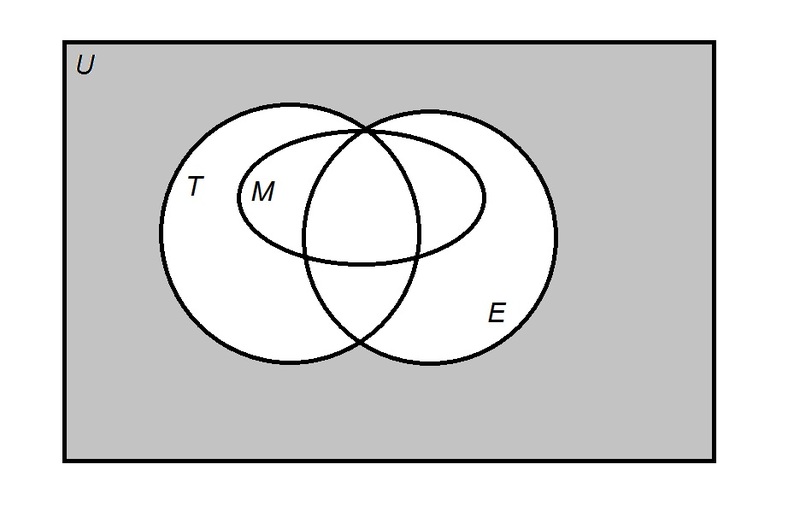 If and , then , a four-element set. 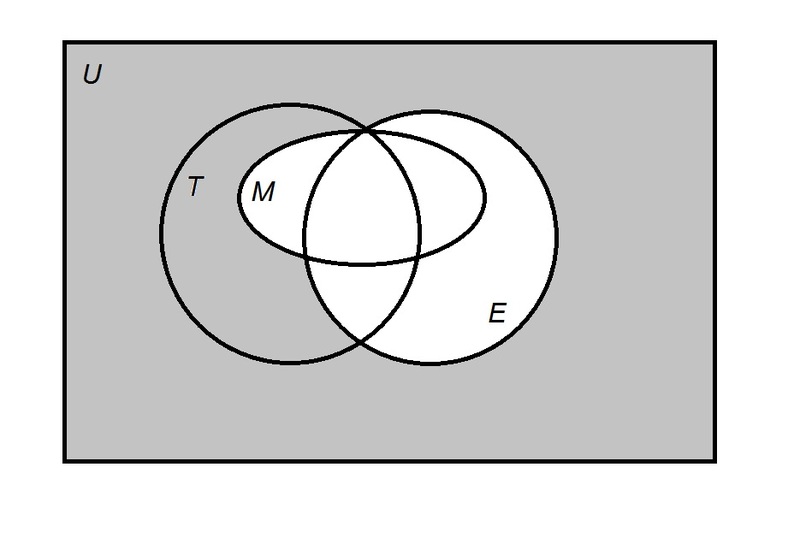 If If and , then , a three-element set. Therefore, we cannot make a conclusion about the size of . 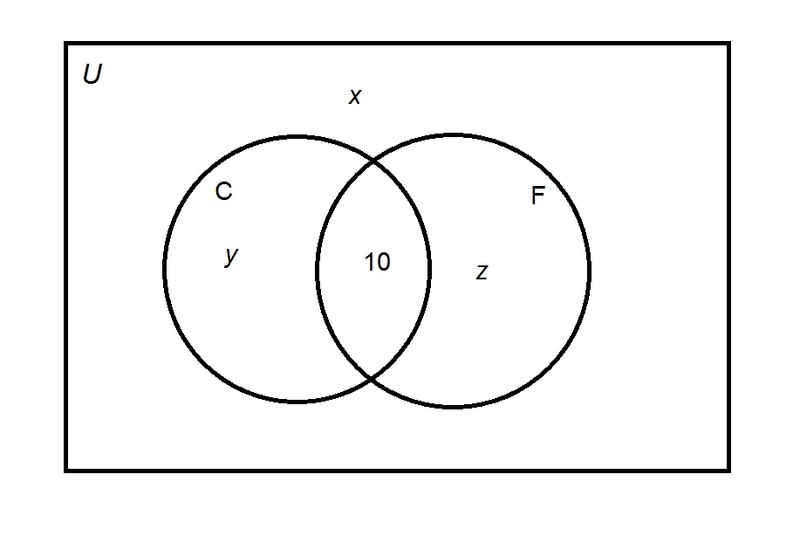 A similar argument can be used to show that assuming only the second statement also does not allow a conclusion. 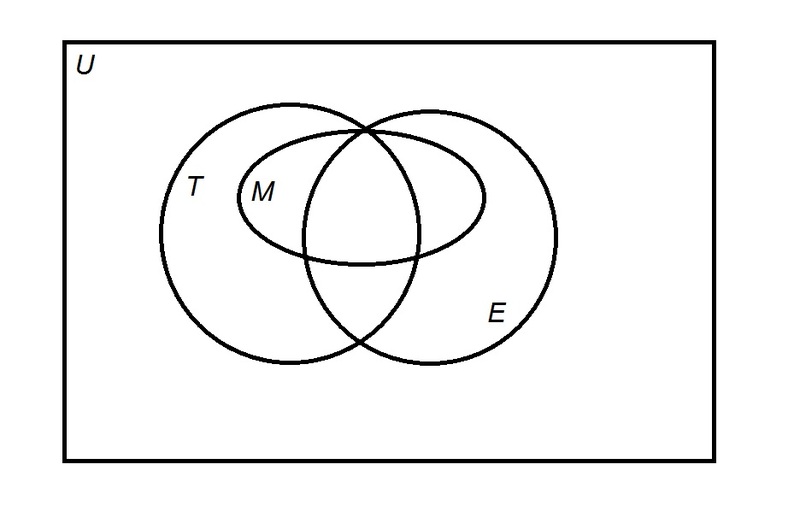 If we know both statements, however, , and we can prove that has four elements. 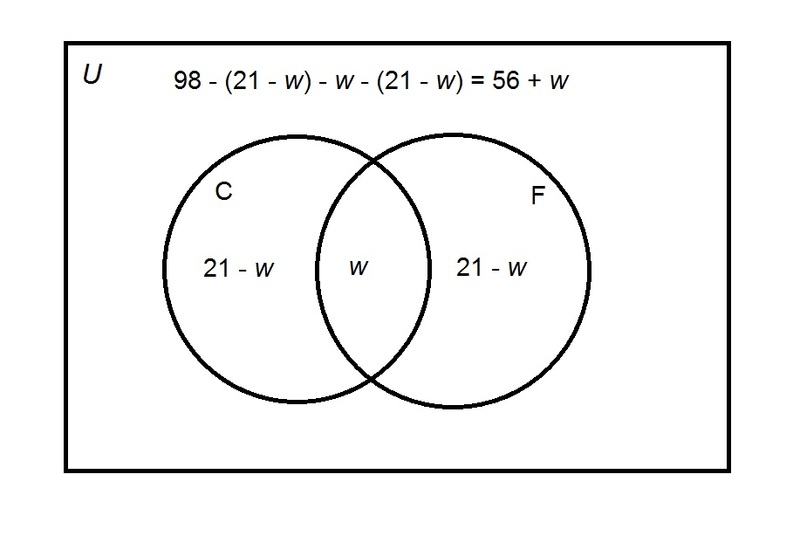 The answer is that both statements together are sufficient to answer this question, but neither statement alone is sufficient. Statement 2: is a multiple of 99.
includes all multiples of 2; includes all multiples of 3. comprises all multiples of either 2 or 3. Knowing is a perfect square is neither necessary nor helpful, as, for example, , but (as 25 is neither a multiple of 2 nor a multiple of 3). How many elements are in the set ? Statement 1: has three more elements than . Statement 2: includes exactly four elements not in . In both situations, has three more elements than and includes exactly four elements not in (1, 2, 3 and 4). However, the number of elements in the union differ in each case - in the first case, , and in the second case, . The two statements together do not yield an answer to the question. In the above Venn diagram, universal set represents the residents of Jacksonville. The sets represent the set of all Toastmasters, Elks, and Masons, respectively. Jimmy is a resident of Jacksonville. Is Jimmy a Mason? Statement 1: Jimmy is not a Toastmaster. Statement 2: Jimmy is not an Elk. The question asks whether Jimmy is an element of . Statement 1 alone - that Jimmy is an element of - provides insufficient information, since contains elements that are and are not elements of . By a similar argument, Statement 2 alone is insufficient. It can be seen that shares no elements with , so Jimmy cannot be an element of . Jimmy is not a Mason. In the above Venn diagram, universal set represents the residents of Belleville. The sets represent the set of all Toastmasters, Elks, and Masons, respectively. Marty is a resident of Belleville. Is he an Elk? Statement 1: Marty is neither a Mason nor a Toastmaster. Statement 2: Marty belongs to exactly one of the three groups. The question asks whether or not Marty is an element of . includes elements that are and are not elements of , so it cannot be determined whether or not Marty is in . Since some of the set is in and some is not, it cannot be determined whether or not Marty is in . If both statements are known, then, since Marty is in exactly one of the three sets, and he is not a Mason or a Toastmaster, then he must be an Elk. 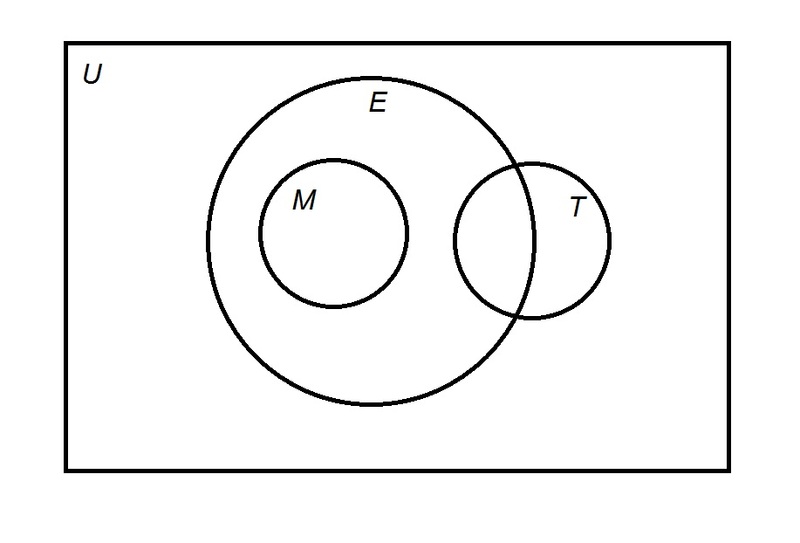 In the above Venn diagram, universal set represents the residents of Eastland. The sets represent the set of all Toastmasters, Elks, and Masons, respectively. Craig is a resident of Eastland. Is Craig a Toastmaster? Statement 1: Craig is not a Mason. Statement 2: Craig is not an Elk. The question is whether or not Craig is an element of . There are elements of this set that both are and are not elements of . Therefore, the two statements together do not prove or disprove Craig to be an element of , a Toastmaster. In the above Venn diagram, universal set represents the residents of Jonesville. The sets represent the set of all Toastmasters, Elks, and Masons, respectively. Jerry is a resident of Jonesville. Is he a Mason? Statement 1: Jerry is a Toastmaster. Statement 2: Jerry is not an Elk. The question is equivalent to asking whether Jerry is an element of set . 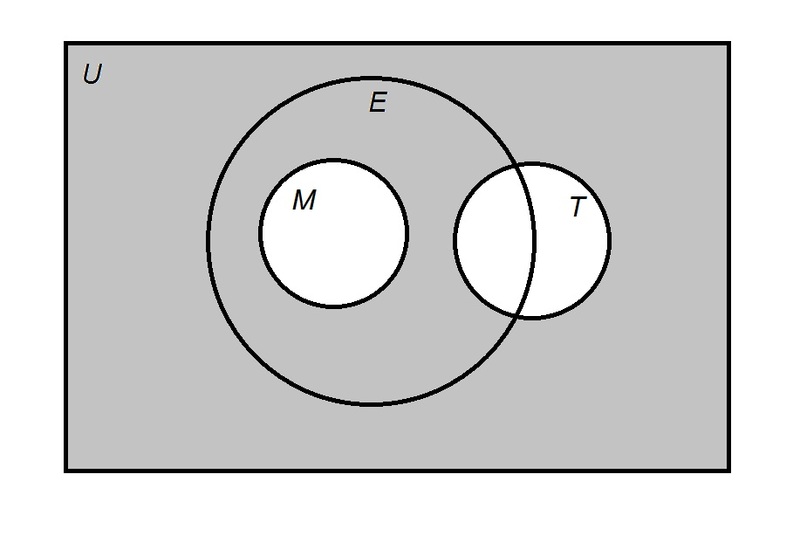 The sets and are disjoint - they have no elements in common. From Statement 1 alone, Jerry is an element of , so he cannot be an element of . He is not a Mason. From Statement 2 alone, Jerry is an element of . Since there are elements not in that are and are not elements of , it cannot be determined whether Jerry is an element of - a Mason. Two of the courses from which the 106 freshmen at Jefferson Academy may choose are American literature and German. How many freshmen enrolled in both courses? Statement 1: 19 freshment enrolled in German. Statement 2: 21 freshmen enrolled in American literature. 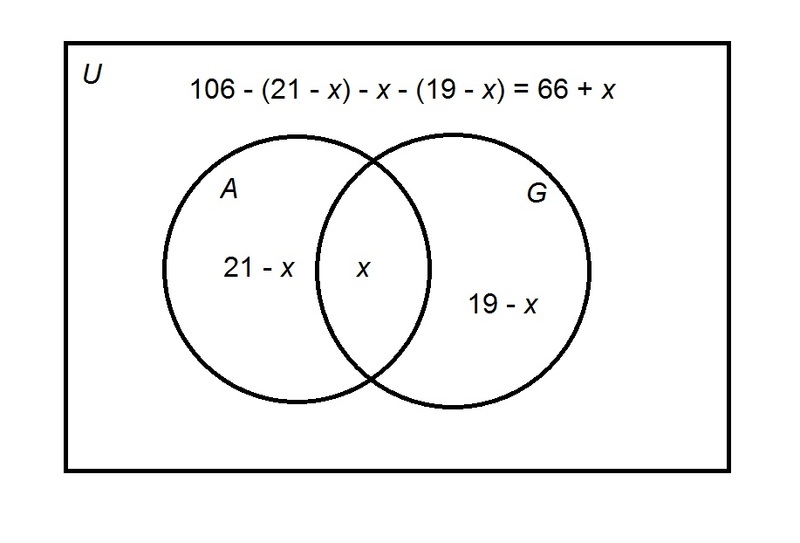 No further information is given in the problem, however, so there is no way to calculate . Two of the courses from which the 98 freshmen at a high school may choose are French and Creative Writing. How many freshmen enrolled in neither course? Statement 1: 10 freshmen enrolled in both courses. Statement 2: 21 freshmen enrolled in each course. The question asks for the number of students in the set , where and are the sets of students who took French and Creative Writing, respectively. It is known that ; subsequently, . But no other information is given, so , the desired quantity, cannot be calculated. Again, no further information can be computed. In the above Venn diagram, universal set represents the residents of Wayne. The sets represent the set of all teenagers, those with an even birth month, and males, respectively. Cary is a resident of Wayne. Is Cary a male? Statement 1: Cary is a teenager. Statement 2: Cary does not have an even birth month. The question asks if Cary is an element of . Assume Statement 1 alone. 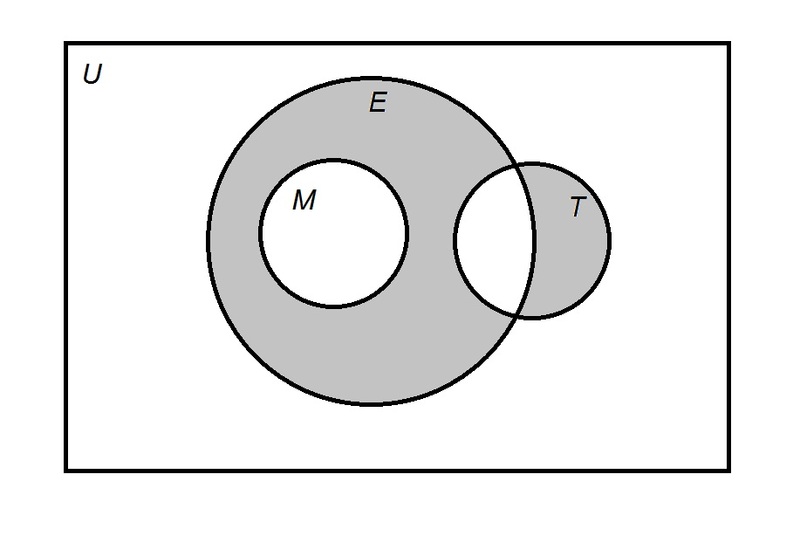 From the Venn diagram, it can be seen that and are disjoint sets. Since Cary is an element of , he cannot be an element of - Cary is not a Male. Assume Statement 2 alone. 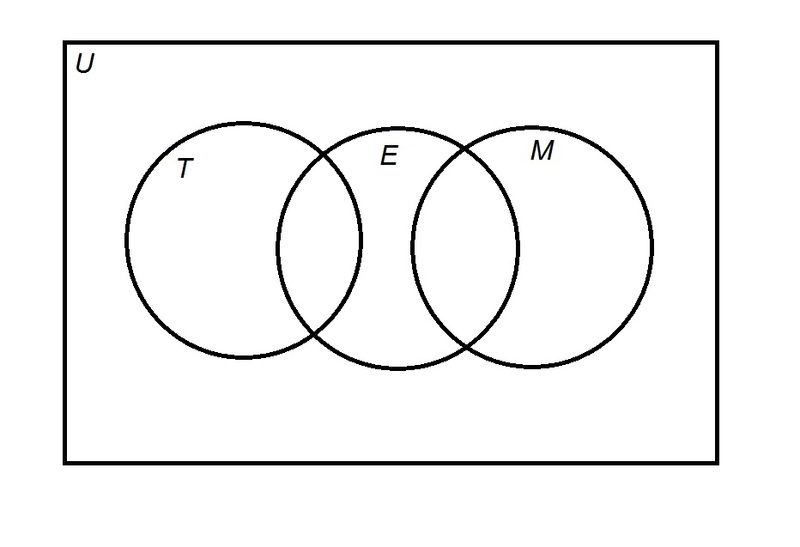 From the Venn diagram, it can be seen that - that is, if Cary is an element of , then she is an element of . Restated, if Cary is a Male, then he is a Teenagers. The contrapositive also holds - if Cary is not a teenager - which is given in Statement 2 - then Cary is not a male.